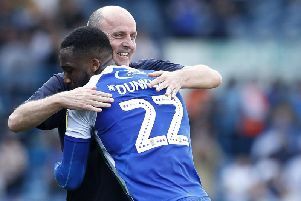 Paul Cook couldn’t hide his disappointment at Wigan Athletic’s failure to send outgoing owner Dave Whelan and chairman David Sharpe out with a win as Leeds United gatecrashed an emotional farewell party at the DW Stadium. The Wigan fans marked the end of an era with a standing ovation on the 23-minute mark - to mark 23 years of Whelan family ownership - of a highly-enjoyable Championship contest that the West Yorkshire side sneaked by the odd goal in three. Sadly the players on the pitch couldn’t quite get the job done, which Cook admitted was a real shame. “It is a massive disappointment not to be able to send them off with a win,” acknowledged the Latics boss. “Especially considering everything they’ve done for the club, the town and the community over 23 years. All of the pre-match talk had centred on the handing-over of power to International Entertainment Corporation, who will assume formal control over the next few days. Cook, though, refused to blame that for his side’s defeat - their first at home all season. “No, it didn’t have any effect on us whatsoever,” he insisted. “When you’re playing Leeds United at home, with the travelling support they bring, it’ll always be a big game that you’re focused on.